I had a pretty typical childhood. I loved swimming in the summer; my friends and I pretended we were “Charlie’s Angels,” packing heat and fighting crime in our Salt Lake City neighborhood; I adored kittens — more than once my sister and I dressed up the family cat in old baby clothes. And I ate Top Ramen regularly for breakfast. OK, maybe not completely typical. Of course, on the weekends, I enjoyed traditional breakfasts: pancakes, French toast, oatmeal with a little brown sugar. 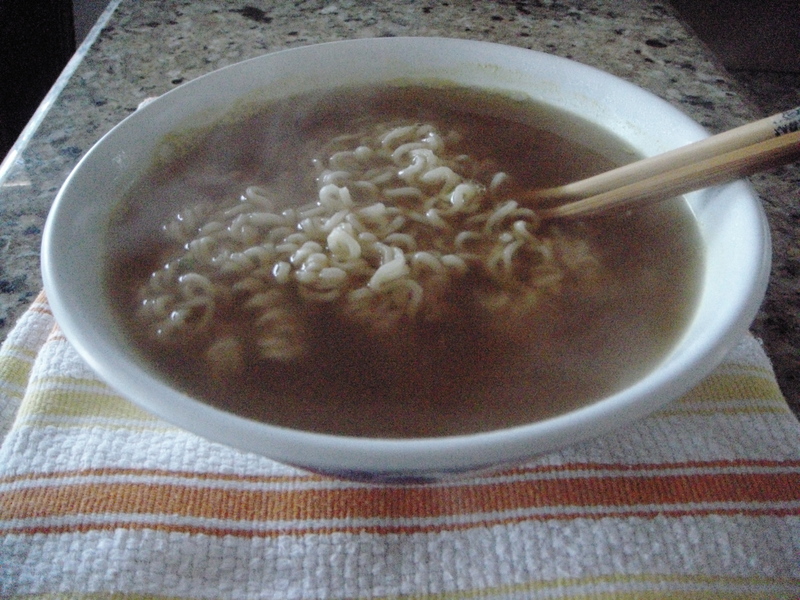 But around the age of 12 and on through high school, my breakfast of choice during the week was ramen. I must have learned this breakfast behavior from my dad, Levi Mike, who never ate “normal” breakfast food. Instead he would make soups and stews, vats of collard greens, Mexican menudo, the leftovers of which would be his morning sustenance. So my penchant for ramen was not terribly unusual. Every morning, I’d start a saucepan with a finger of water and cut the top of the flavor packet, leaving a graveyard of silver trimmings in the drawer where the scissors lived. In less than three minutes, I had a savory, salty, warming pan of noodle soup. Rather than dirty a bowl, I would eat the soup right out of the cookpot, and to get to the “meat” of the meal faster, I would slurp the liquid with a giant mixing spoon. (J and I still have that spoon and use it often, though it’s been retired as silverware.) Once the broth was out of the way, all that remained were the delicious, slippery, curly noodles. I would savor them lovingly, making them last as long as possible. After one unfortunate morning when my mother asked for “a bite” and ate HALF THE NOODLES on one forkful, I became fiercely protective, guarding my noodles with the ferocity of a junkyard dog. Though I don’t often eat ramen for breakfast anymore, every once in a while I wake up with a craving. I’ve graduated to bowls, and I now use a regular soup spoon. But don’t ask for a bite, even on your birthday. Call me selfish, but for 20 cents or so you can have your very own bowl of noodles for breakfast, in under three minutes. I’ll start the water for you. I remember you and your ramen packets. I liked it, but not as much as you did. The best ramen I’ve ever had was camping. We added diced green onions and a poached egg. Gourmet ramen. mmmm mmm good. I also love the graveyard of silver trimmings in the drawer reference! I can see it so well! Oh yes … since the early days, I’ve dressed up ramen in all kinds of exotic ways. My favorite is pretty much still straight up without too many changes. Dad used to chide me for the ramen flavor packet trimmings. But, really, who has time to clean that up when you’re just trying to make breakfast! Remember the days of baked ramen (rather than the Ramen pack they sell now). We felt a little bit healthier eating those. I try to only indulge when I’m feeling puny. Roast chicken is still my favorite, always have some in the cabinet (as you know). Oh, by the way, I only consume the noodles, never the liquid. We call those “dry ramen.” Those are good, too. Sometimes we drain our ramen, dress it and eat it alongside a good tomato sandwich. Yum. Making me hungry! Oh AND who could forget that 1st bite of ramen, you’re hooked! I know I was. Oh man, this reminds me so much of summers on swimteam when I would eat Top Ramen for lunch every single day. It was one of the only meals I could make by myself and I’d cook vats of it for my little sister and me. I wouldn’t share, either, and I liked eating the noodles raw… Beautiful post, this really took me back. Aww, thanks so much, Anna. That means a lot coming from you! I’m glad you enjoyed a trip down your own memory lane.